OEM or brand is available. Coating layer: Nontoxic resin possible metallized AL combined pigment. 2. Stamping type: Rich colorful design and patterns, hot stamping for partial transfer, whole transfer and special transfer. 3. Stamping materials: All konds of fabric, textiles and leather. (2) Much attention must be paid to the good match of temperature, speed and available gluewater. (1) NORMAL HOT STAMPING: about 110~140 °c temperature ; Stamping speed: 15~40m/min; Heat Preservation: put the stamped material with foil into the glasshouse at 50~80°c, then seperate the foil from the stamped material after about 12 hours. (2) SPECIAL HOT STAMPING: about 120~180 °c temperature; Stamping Speed:20~50m/minutes, no need Heat Preservation. 1. Put the hot stamping foil on the cloth coated available glue. 2. Pressure the hot stamping machine and wait for about 2 seconds. 3. Take out the cloth with hot stamping foil immediately. 4. 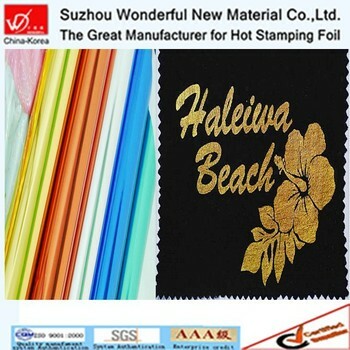 Let the hot cloth with hot stamping foil cold for some minutes. 5. Slow to separate the hot stamping foil from the cloth. 6. Get the good result of hot stamping foil transferred in cloth. 3. Normally the samples are free, but would you please pay the freight postage? Suzhou Wonderful New Material Co., Ltd.